(MENAFN - Muscat Daily) The razzmatazz and the flashlights may have been reserved for the stars at the Bahrain Formula One Grand Prix, which concludes at the Bahrain International Circuit in Sakhir on Sunday. But a day before, under slightly overcast conditions, a young Omani 20 year old racer, Al Faisal al Zubair, did shine bright with his historic achievement at the same venue when he became the first-ever driver to win back-to-back driver's championship titles at the Porsche BWT GT3 Cup Challenge Middle East Series on Saturday. Having gone into the final round of the six-leg series with a healthy 41-point championship lead over his nearest rival, Berkay Besler of Turkey, Al Faisal began the penultimate race fourth on grid. 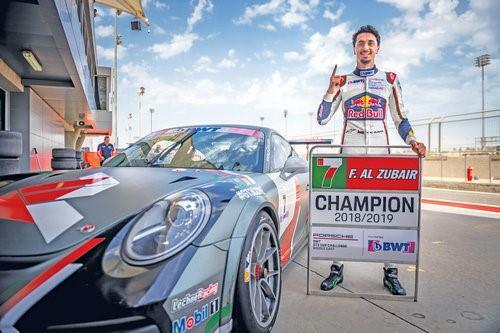 Displaying sensible racing skills, the Omani racer avoided any bravado on the track and with his goal crystal-clear –championship title - he did just enough to capture it in front of a small group of his supporters, including his father Khalid al Zubair. Al Faisal finished with 340 points against Besler's 310. The race was won by Besler, but with a strong 30-point lead, Al Faisal ensured that he retains the prestigious title with a race remaining and hopes to 'wrap the series on a high with a victory tomorrow'. In his exclusive remarks to Muscat Daily, a delighted Al Faisal said, 'All it matters is the championship title and I am very happy to have won it back to back, the first time any driver has done it. Meanwhile, Al Faisal's country mate Khalid al Wahaibi also was on the podium when he won the GCC honours on Saturday in the 15th round. The 18 year old came fifth in the race on Saturday and is placed overall fourth in the championship. Al Faisal's performance this season was fairly consistent as he had won eight of the 15 races till Saturday. Besler, despite winning the race on Saturday could garner 310 points and with a round to go (25 points at stake). Al Faisal's ninth place on Saturday was enough to secure him the title. The 18-car race grid saw the return of Luxembourg's Dylan Pereira and current Porsche Carrera Cup GB champion, Tio Ellinas of Cyprus, and both drivers started the race on the front row following a dominant qualifying display on Friday where Al Faisal qualified fourth and second for the final race on Sunday. Oman's Khalid currently occupies fourth, ahead of South African Saul Hack.